Like us, like all mammals, an elephant’s eye has one large lens, its aperture always open, except for a blink, or in sleep. 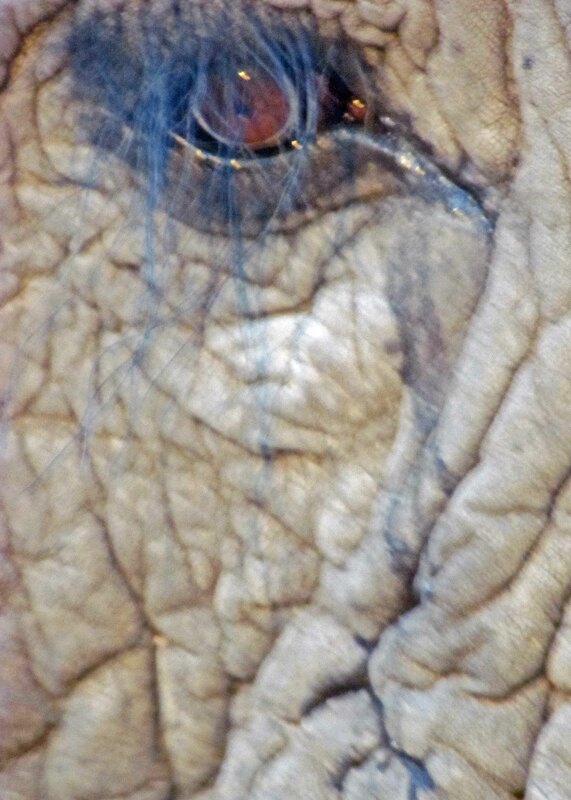 Like us, like all mammals, Jabu’s round iris controls the amount of light that enters his pupil. Like us, the lens of his eye focuses light images on his retinas, where they are converted into chemical and electrical impulses, and conveyed along the optic nerve directly into his brain. The iris is the only muscle of our bodies not colored a shade of red. It contains pigment instead. The density of that pigment colors our eyes from brown to blue, mostly shades of brown for elephants, although a blue-eyed calf was photographed this year in South Africa. Iris is the Greek word for rainbow. When light refracts through countless prisms of rain, it produces that arched scatter of reds, greens, blues and violets that we call rainbows. But what we see is only half the story. Rainbows are perfect circles cut in two by the horizon. It’s only possible to see a complete circular rainbow if you are in an aircraft and the sun is high enough behind you. A round rainbow is named a “glory.” A halo for the earth. How did the Greeks know rainbows are round? Hurtling towards earth at 186,282 miles per second, light from the sun is carried by subatomic particles called photons, which vibrate up and down in perpendicular motion to the direction of the advancing light waves, passing along their energy to the retinas of our eyes. Photons are both the medium and the message, carrying waves like water carries waves, invisible surf lapping against the islands of my eyes. The cells in my eyes, in Jabu’s eyes, are precisely one photon wide. I blink, he blinks, photon by photon we gaze into each other’s souls. Flattery will get you everywhere, Gill! Thanks. Lovely examination of our oneness with nature.